The main purpose of writing the new Basics of Biblical Greek Grammar, Fourth Edition is to help you to understand better and to communicate more clearly the Word of God. This must be kept in mind at all times. It should motivate you, encourage you when you are frustrated, and give you perspective when you think you are going to crack. Remember the goal: a clearer, more exact, and more persuasive presentation of God’s saving message. But is knowing Greek essential in reaching this goal? If you are not fully convinced that this is so, you may have difficulty reaching the goal. In other words, is knowing Greek worth the effort? We have been blessed with a wealth of good translations, and a careful use of these goes a long way in helping the preacher understand the Word of God. 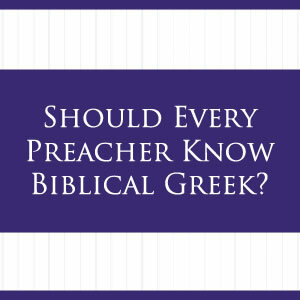 It would be unfair to claim that the only way to be a good preacher is to know Greek. However, allow me a little parable and the point will become clear. You need to overhaul your car engine. What tools will you select? I would surmise that with a screw driver, hammer, a pair of pliers, and perhaps a crow bar, you could make some progress. But look at the chances you are taking. Without a socket wrench you could ruin many of the bolts. Without a torque wrench you cannot get the head seated properly. The point is, without the proper tools you run the risk of doing a minimal job, and perhaps actually hurting the engine. The same is true with preaching, teaching, and preparing Bible studies. Without the proper tools you are limited in your ability to deal with the text. When Jesus says of communion, “Drink ye all of it” (Matt 26:27; KJV), what does the “all” refer to? All the drink, or all the people? When Paul writes to the Ephesians, “For it is by grace you have been saved, through faith—and this is not from yourselves, it is the gift of God” (Eph 2:8; NIV), what does “this” refer to? When Paul asks, “Do all speak in other tongues?” (1 Cor 12:30; NIV), is he implying that the answer is “Yes”? But there is more. Almost all the best commentaries and biblical studies require a knowledge of Greek. Without it, you will not have access to the lifelong labors of scholars who should be read. I have seen a rather interesting pattern develop. The only people I have heard say that Greek is not important are those who do not themselves know Greek. Strange. Can you imagine someone who knows nothing about tennis say that it is unnecessary to take tennis lessons? The point of all this is to emphasize that you must think through why you want to learn Greek, and then you must keep your goal in sight at all times. John Wesley, perhaps one of the most effective ministers ever to mount a horse, was able to quote Scripture in Greek better than in English. How far do you want your ministry to go? The tools you collect, Greek being one of them, will to a significant degree determine your success from a human point of view. Set your goals high and keep them in sight. Very few people can “pick up” a language. For most of us it takes time, lots of it. Plan for that; remind yourself what you are trying to do, and spend the necessary time. But along with the amount of time is the matter of consistency. Few people can learn a language on their own. Find a partner, someone who will test and quiz you, encourage and support you, and vice versa. Discipline is the bottom line. There are no magical solutions to learning Greek. It is achievable if you want it. It comes at a cost, but the rewards are tremendous. So get ready for the journey of your life as we travel through the pages of the Greek Testament in Basics of Biblical Greek Grammar. Enjoy the excitement of discovery and look forward to the day when it will all bloom into fruition. — William D. Mounce, adapted from his new book Basics of Biblical Greek Grammar, Fourth Edition. If you haven’t learned biblical Greek, this is the perfect place to start: today’s most popular introduction to biblical Greek, in a brand new fourth edition. This is a smart choice for pastors and Bible teachers committed to taking their Bible knowledge to the next level, because Mounce understands that “learning the language of God’s Word . . . is a tool for ministry, helping you to get closer to what God has said through his writers.” This book will help you do exactly that, benefitting you and those you minister to as a result. Get your copy of the grammar today. Also, check out these other resources designed to help you excel: the workbook, video lectures, vocabulary cards, and laminated sheet.